1. Turkey on the edge: The Turkish lira plunged as much as 13% against the dollar on Friday, hitting a fresh all-time low. "The country could now be in danger of heading for a bust," Carsten Hesse, European economist at Berenberg, wrote in a research note. Turkey has experienced years of fast growth, but inflation has spiked and the country's borrowing costs have increased. Foreign investors are fleeing the country amid uncertainty and rising interest rates in the United States. President Recip Tayyib Erdogan has unnerved investors by calling on the central bank to keep interest rates low, an unconventional response to rising prices. Hesse said that pressure on the currency and Turkish bond yields increased further after the United States imposed sanctions on August 1. 2. Oil prices hit: Oil prices dropped as much as 0.9% to trade at $66.30 per barrel. Investors have been spooked by the rising geopolitical tensions between the United States and Russia, and between Canada and Saudi Arabia. The International Energy Agency, which monitors energy markets for the world's richest nations, warned Friday that the oil market could soon become "less calm." "As oil sanctions against Iran take effect, perhaps in combination with production problems elsewhere, maintaining global supply might be very challenging," said the Paris-based agency. 3. Ryanair strikes: Ryanair was forced to cancel nearly 400 flights on Friday because of pilot strikes in some of its biggest markets. The discount carrier said it was forced to cancel flights in Germany, Ireland, Belgium and Sweden, affecting thousands of passengers. About 15% of its scheduled flights were affected. Staff strikes have already forced the cancellation of hundreds of flights this summer. Separately, strikes by French air traffic controllers have forced Ryanair to cancel about 1,500 flights and delayed 7,000 more. Shares in Ryanair (RYAAY) fell 1% in London. European markets opened down, following a mostly negative trading session in Asia. The euro dropped 0.7%. 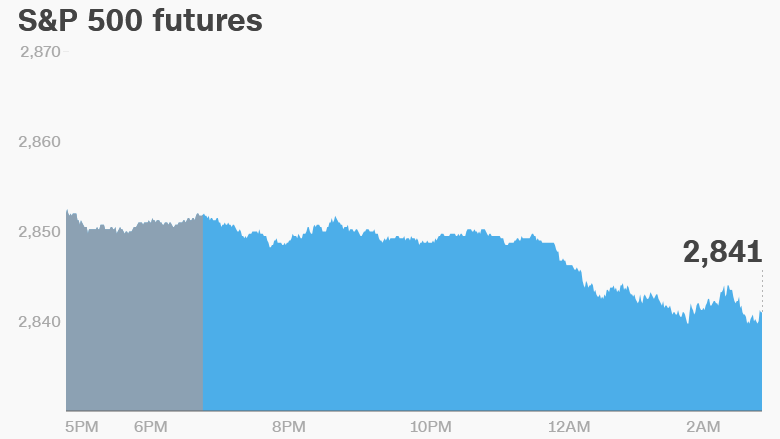 The Dow Jones industrial average closed 0.3% lower on Thursday, while the S&P 500 dropped 0.1%. The Nasdaq was flat. 5. Earnings and economics: Meredith (MDP) will release earnings before the bell. The US Bureau of Labor Statistics will publish its July CPI report at 8:30 a.m. ET. The UK economy grew 0.4% in the second quarter compared to the previous three months, according to the Office for National Statistics. That's an improvement from the first quarter, when GDP expanded just 0.2%. The pound dropped 0.5% against the dollar to trade at $1.27. The pound has lost roughly 3% so far this month as investors worry about the possibility of a no-deal Brexit. Canada's jobs report for July will be published at 7:30 a.m. ET.